If you are using Apple Compressor, you can download our custom setting and import it by dragging the file into Compressor. From here, you can modify it by changing things like the output location. If you are making your own preset, here are our recommended settings, as well as, some detail about why they've been chosen. To start with, we want an MP4 file. None of compressor's presets are tailored to produce these (Apple device presets produce M4V files). Click the + button at the bottom of the settings pane and choose " New Setting". This will open a window where you can select the format to create. 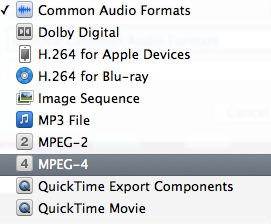 Select MPEG-4 and give the preset a name and description in the next pane. On the General settings page, leave " allow job segmenting" unchecked. This setting allows an encoding job to be distributed to a shared group of computers. Unfortunately, it cannot be used with multi-pass encoding. You'll want to set a default location for output files that is aligned with how you organize your media. Optimize for network use should be checked. This is Apple's name for the Fast-Start setting. Checking this box will place the moov atom at the beginning of the file, so that it can begin playback after only a small portion of it has been downloaded. Leave retiming duration as 100% of source. On the Video properties tab, you should specify a frame size of up to 720p. This way, if your source is a lower resolution, it will not be upscaled. If you select one of these automatic frame settings, the pixel aspect ratio is set automatically. Frame rate can be left at automatic, in which case it will preserve the source frame rate. The only time you will need to set this manually is with high frame rate footage, where you'll want to make sure that it's 30 fps or less. If you are targeting broad compatibility, select H.264 Main profile and CABAC entropy mode. These settings will playback on the iPhone 4s and above, as well as, Android phones of a similar vintage. If you aren't as concerned about supporting older devices, or if you need 1080p output, then you'll want to choose the High Profile and CABAC entropy mode. This is supported by the iPhone 4s and iPad 2 and all more recent iOS devices. Key frame interval is specified in terms of frames. 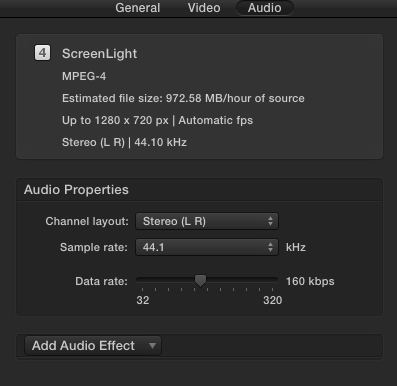 I would set this to 30 so that there is a keyframe approximately once per second. This will help people in Firefox on the Mac and IE8 scrub to each second of the video. Select a datarate of 1500-2500 Kbps. If there is lots of motion and fine detail, you may want to choose the higher end of the spectrum. 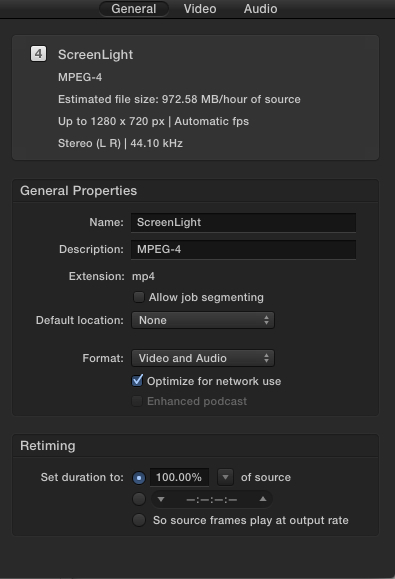 If it's talking heads or you want to optimize for file size choose something on the lower end. For this profile, we've split the difference and selected 2000 kbps. You may want to play around with multi-pass and single pass encoding in Compressor. I've seen articles that suggest there are some peculiarities with Apple's encoding engine that produce better results with single pass. You can leave leave frame reordering checked, as Apple says it can provide a better-quality output file. The Cropping & Padding and Quality settings can be left at their defaults. The default audio settings should work fine for creating review material. To preserve compatibility with older devices, you probably don't want to go above 192 kbps. Now that you've finished creating a preset, you can turn it into a Droplet. To to this, highlight the setting in the left pane of compressor, right click it, and select " Save as Droplet". Now all you have to do is drag files onto the droplet to initiate an encoding job.